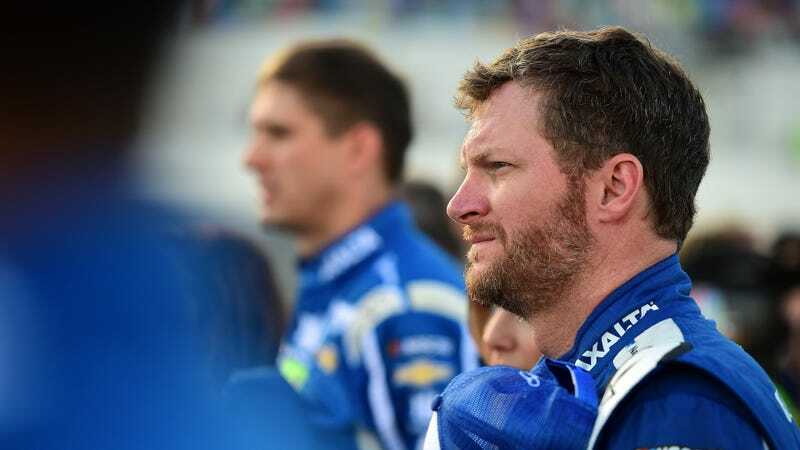 Dale Earnhardt Jr., NASCAR’s most popular driver for the past 14 years in a row, announced a few months ago that he’d retire at the end of the season. Hearing that—that the end of an era was on its way, basically—was depressing enough in itself, but things just keep getting worse as the year goes on. Earnhardt simply isn’t having a good year, and it’s easy to tell that it’s taking a toll on him. He returned from sitting out for a huge chunk of the 2016 race season with a concussion, only to wreck out of his final Daytona 500 and finish 37th. In April, he announced his retirement, which was heavily influenced by that long concussion recovery. But the race-ending problems didn’t end. Every weekend, almost, it feels like there’s a new “last” for Jr.—his last race at Indianapolis Motor Speedway or Daytona International Speedway as a full-time Monster Energy NASCAR Cup Series driver, his last road-course race, his last... everything, it feels like, in terms of racing. And every weekend, almost, that last ends in an almost last-place finish instead of a triumph. In 22 races this year, Racing Reference’s stats say Earnhardt’s race has ended in a crash five times. He’s had two engines go bad. His finishes range from good to average to bad, with Earnhardt only having one top-five and four top-10 finishes this year. He was on the pole once, at Daytona. He crashed out of the race while on a comeback run after hitting the wall. With four races left until the playoffs, which is just the “Chase” championship format that NASCAR renamed to sound more like a ball sport, Earnhardt is 23rd in points and needs a win in the next four races in order to compete for the title. A win gives drivers an almost automatic playoff spot, and 13 have gotten one. It would be 14, if Joey Logano’s early victory at Richmond hadn’t been reduced to nothingness by NASCAR. Only 16 drivers get to race for the title in the playoffs, while the rest get to hang out and make laps for the last 10 races. Barring any drivers randomly dropping out of the sport in the next few weeks, Earnhardt is 258 marks behind the cut line and mathematically cannot qualify on points. He’s been noticeably disappointed in post-race interviews, too. Honestly, I’m not one to feel for big-time drivers when something disappointing but non-life threatening or injury causing happens in a race. They can go cry in $100 bills about finishing last, for all I care. “We have to go into every race like this is going to be the week that we get it done. I think that’s the only attitude you can have if you expect to take advantage of an opportunity because one might fall in your lap and we just might find what we’re looking for before the season is over,” he said. “Certainly if we miss the playoffs, we’re still going to try to win a race. We’re still going to show up and try to give it everything we’ve got. There’s nothing worse than leaving the race track feeling like you didn’t try your best or didn’t give everything you had. Motorsport.com reports that Earnhardt called it “a difficult year,” but not his most challenging. He said he feels like the team will still have things to be proud of before the season ends. Earnhardt climbed out of his car under a sign for Gasoline Alley, drawing the loudest applause of the day, and disappeared from view. Fans in blue Dale Earnhardt Jr. T-shirts followed him out, walking to the infield parking lots, triggering a bizarre exodus of cars out of IMS even as the Brickyard 400 was still running. Larryssa Mercer of Brownsburg, Ind., was wearing a faded blue Dale Earnhardt Jr. T-shirt and a devastated look as she walked out of the grandstands. Not sure that I was seeing what I was seeing, I had to ask her: Are you leaving because Dale’s out? Is that why everyone’s going? I’m definitely not getting misty eyed over here. Not at all. But if I were, I’d probably try to remember that I don’t have $100 bills to wipe my face with to try and stop this unexpected water at the source.